Most people know that the Prince of Wales is fabulously wealthy and will one day become the King of England. But how many of you know that he recently renovated a country cottage in Romania and, in order to generate local employment, is making it available as a guest house? I recently spent a weekend at this guest house, which opened a few months ago, and I can report that it is sensational. There are no “royal” pretensions at this humble abode, in fact the whole set up is quite down to earth: you need to go outside in order to reach the dining room; at night it is pitch black and you can hear the sounds of wildlife. The only indication of the owner’s identity is his coat of arms on one of the walls. The previous owner was the local judge in the village of Zalanpatak, a 120 soul settlement in the heart of Covasna county (just north of Brasov). The buildings are over 200 years old. 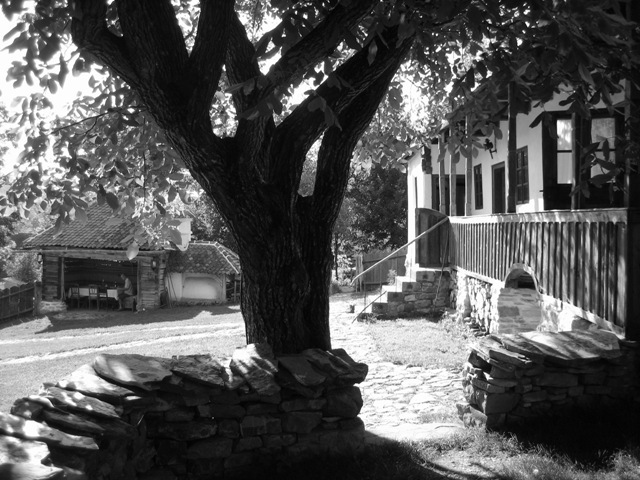 What makes the guest house in Zalanpatak a sensation is partly the location, in one of the most remote villages in Romania, and also the beautiful way it has been renovated. The rooms have been done up in the best of taste in the old peasant style, with lots of antique wood detail and hand painted furniture, but with mod cons too. Each room has a shower room, a kettle, an eccentric array of lighting and wonderful bedding. The renovation was done by Count Tibor Kalnoky who has other incredible guesthouses (and a couple of ruined castles) slightly nearer to Bucharest (see www.translyvaniancastle.com). In my opinion he has the most tasteful and impressive rural tourism operation in Romania. Food is provided by local Hungarian villagers and is delicious. Other locals provide driving and guiding services and there is a host of things to do in the area: playing in the river (my kids loved this one); walks in the forest, bear and bird watching, visiting caves, horse riding. Most of the guests seem to come from UK and many of them stay for two weeks — each day of which is packed with activities. Zalanpatak in Hungarian (Valea Zalanului in Romanian) is located about 90 minutes north of Brasov. The nearest town is Baraolt (Covasna County). There is a direct train connection from Bucharest to a micro-station with a grand name: Augustin. The 6am train from Bucharest has a bike wagon (I got that train up on Saturday morning and the 1622 return on the Sunday – with my bike). Zalanpatak is about 25km from Augustin – an easy ride for any cyclist who is reasonably fit. They will pick you up from the station if you ask; it’s all part of their excellent service. To contact Count Tibor Kalnoky and book a room call 0742 202 586 or email k@transylvaniancastle.com. Although he’s an aristocrat he’s very friendly and down to earth. And check it out online at www.transylvaniancastle.com (search for Zalanpatak or Prince Charles’ guest house). Totally agree – a lovely place, added to the latest edition of the Rough Guide. But I wish I’d cycled there! It is a pleasure to see Kalnoky succeeding. he certainly deserves to after all the hard work, dedication and inspiration. Those old houses are wonderfully atmospheric and I dream of living in one. I’d like to ride a horse over to Zalanpatak – probably it’s quite feasible too. You can actually horseride to Zalanpatak from Count Kalnoky’s other location — Miklosvar — he organised riding tours of the area. I would like to assist you to learn the true opinion of the British public. There are MANY people who would prefer his glorious Mother to concede the crown only to his eldest son. Apparently, even Her Majesty accepts that her male children have been a great disappointment in many ways. HOWEVER, public opinion aside, it would appear that Prince Charles and I have something in common… our love for Romania. I may not exactly want to be a possible friend of his (I wish) but I do appreciate his taste for beauty. He owns large areas of Cornwall, similar in beauty to Transylvania. Also, his great, great, great, grandmother Queen Victoria was the cousin of Princess Elizabeth of Romania who redesigned the inside of Bran Castle circa 1920’s. I am sorry that for the past 2 years I have been to the Medievala festivalul at Sighisoara and I had no knowledge of Miclosoara as I drove through Maierus…. Who knows, perhaps next year I may visit and soak up the beauty of the Olt river valley… in the ONLY country worth visiting. I don’t know how he does it but he really sees the best parts of the country. Not crowded with tourists, but in a paradise- like nature. Quite surprised that someone with the surname Murray does not realize that Prince Charles will not one day become the king of England. England is not a state and has not been for at least 3 centuries ,it follows therfor that you cannot have a king for part of a state. He may of course , if we are unlucky enough , become king of the United Kingdom. Nice piece, Rupert. I hope to see this place soon, have a buddy up that way. I love some of the comments you have received. Why does Peter Fay ‘wish’ to be ‘a friend’ of someone who was ‘a disappointment’ to his ‘glorious Mother’? The words hare and hound spring to mind. And toad. Curious too that the pedant MacGregor ‘does not realize’ that your surname is not ‘Murray’ but ‘Wolfe-Murray’. Bet he doesn’t know why, either. Now there’s a story. Perhaps you should post it. I’ve never written about my family name as it would somehow feel a bit like showing off; an interesting one for the therapist! Where did you hear about it? I like and apreciate the article but you keep using the word “Zalanpatak” and the formula “Zalanpatak in Hungarian (Valea Zalanului in Romanian)” .Well the name of the village is VALEA ZALANULUI and ALL ROMANIANS don’t care how EXTREMIST HUNGARIANS call it,THE NAMES AREN’T TRANSLATEABLE,so keep truth to your apparent love for the house,village and country and use the REAL NAME. Formula “Zalanpatak in Hungarian (Valea Zalanului in Romanian)” REALLY HURT ME,as the village and county it is part of ARE IN ROMANIA,SO USE THE REAL NAME,”VALEA ZALANULUI” without mentioning the name hungarians call it AS IT NOT THE OFFICIAL NAME. Normaly,you use its (Romanian) official name and maybe in parantheses the way hungarians call it,but as it is an article about a Romanian village and as Romanians don’t care about the s*i* hungarians call it ,DON’T EVEN MENTION IT ON PARANTESES.